Providing Harrison County children with their need, want, and wish each Christmas. To help families with gifts for their children at Christmas. It all started in 1914 when Elizabeth Scully, a grocers daughter, noticed how many families came in the store that were in need of help. As a result, she decided to start the Empty Stocking Fund to help the families in need she saw around her. At some point, Father Henry F. Selcer, Rector of Trinity Episcopal Church, took the leadership role over from Ms Scully. Father Selcer was devoted to the mission of the Empty Stocking Fund and found various ways to celebrate Christmas each year. He was known host parties at the the Paramount Theater in downtown Marshall, where he would pass out gifts to the children and give food baskets to the families. He was involved until his death in 1956, where at his bedside, Mrs. Ora McGee, (Mr. Harry McGee IV's grandmother) promised Father Selcer that she would never let Empty Stocking Fund die. She made good on her promise by heading up the project until she was in her late 80's. That that point, she received some welcome help when her granddaughter-in-law, Lenecia "Lea" McGee, begin working with her in 1985. Back then, Mrs. Ora McGee helped about 50 families each year. Lea helped her grandmother-in-law for several years before eventually taking over the mission in the early 1990's. When assumed leadership, Lea decided it was time to expand the program to help even more Harrison County families. Over the years the organization has helped thousand of families know the love and joy of Christmas. In some years, it has helped as many as 650 children in one christmas project. The Fund usually works with 300-450 children each year. The promise made to Father Selcer has been more than kept. Families in need must have and interview and submit an application to the Empty Stocking Fund to be considered for assistance. The children receive a "need", a "want" and a "wish" along with books, games and toys they can use as a family. 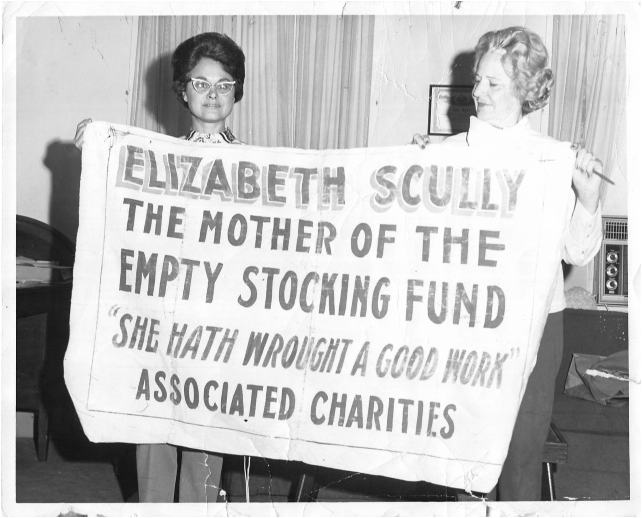 The Empty Stocking Fund has had only 4 Directors/Organizers since 1914. Elizabeth Scully, Father Henry F Selcer, Mrs. Ora McGee, and current Lenecia "Lea" McGee. The Empty Stocking Fund has no paid employee's, no overhead, and 100% of every dollar given is used to help families in need. Please pick up an extra toy, pair of shoes, coat, or whatever a child may need this Christmas when your out shopping. Bring it to Lea and she will get it to a special Angel! Or better yet, sponsor a child from our Angel List. Feel free to call Lea if you would like to volunteer to help with the Empty Stocking Fund!